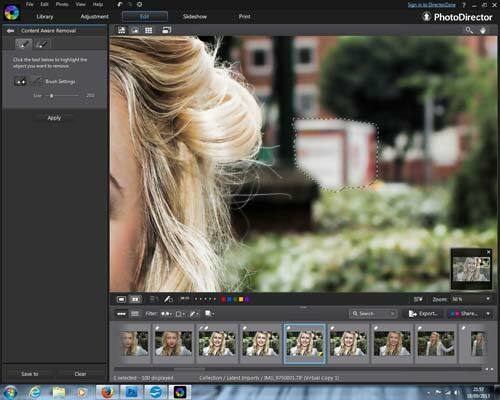 Cyberlink have unleashed their fifth instalment of PhotoDirector; the photo tagging and editing system. With thirteen new features such as Bracketed HDR, Auto lens correction and Split toning, PhotoDirector 5 appeals to the photographer looking to add professional looking results to their photography. It costs £79.99, or £59.99 if upgrading from version 4. We installed Cyberlink PhotoDirector 5 from a dedicated FTP server, but it's possible to either download from the Cyberlink website or purchase a hard copy. If you download from the website you can try the program on a 30 day trial. There are two versions to PhotoDirector 5: Ultra and Suite. Despite Ultra sounding like the premium option, it's actually the more basic of the two. The reasoning behind this is that the Suite also contains ColorDirector Video Grading tools. Incidentally, six of the new features are contained in this program. So if you only get the Ultra version, you'll miss out on nearly half of the new features. Still, it's only an extra £20 and video is a big part of photography these days, so even if you're not thinking about using video just now, it could happen in the future. Version 5 is laid out in the same tried and tested way that version 4 was and version 3 etc. If this is your first time with a PhotoDirector program, it's split into five sections. The initial section (Library) is designed to file and categorise all your pictures that you flow through. Import your images through the File drop down at the top of the page. You can import an image, an entire folder or even direct from a tethered camera. Importing images into Cyberlink PhotoDirector 5 as a folder will bring up a window for you to select whether you want to import every one or cherry pick your favourites. 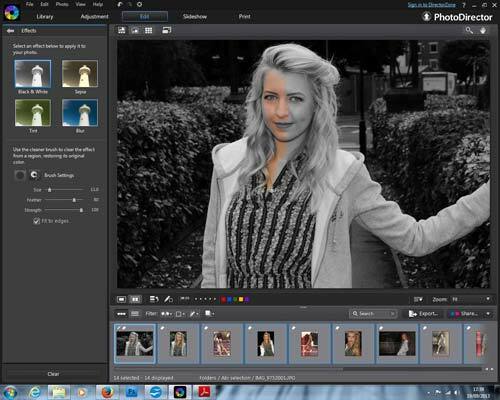 You can then add any filter presets, a copyright to place in the EXIF data and tags for finding them at a later date. You can also rename them if you don't have your camera set to continuous scrolling on the file numbers. It took moments to import 96 TIFF files but all the images weren't ready as thumbnails in the preview ticker below at this stage. Below the Library tab are two more tabs. The left is default open, titled Project. 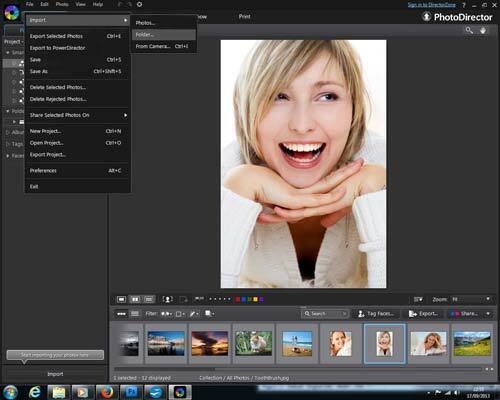 It shows the file path that your images have taken to get loaded into PhotoDirector. Click on Metadata and all the EXIF data from the highlighted image (shown in the main preview window) will appear on screen. This will include the copyright if you added it and the tags at the bottom. Once all your images are tagged and copyrighted, you can move onto the Adjustments tab. There are two sub-sections to this, just like in the Library, but called Manual and Presets. The program defaults to Manual, but if you don't have time, you could use the many preset effects in already loaded on. 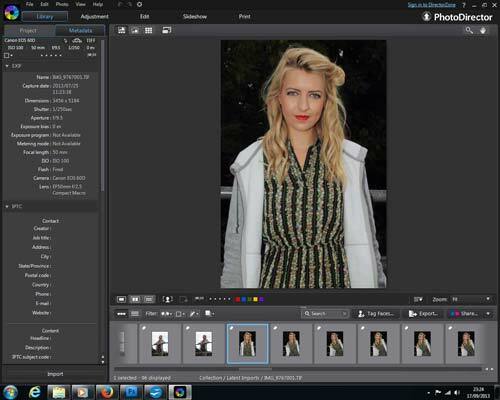 This is what we like about PhotoDirector. In some other programs, you'll only get six to 12 preset filters unless it's filter software. PhotoDirector has over 40 with the option to download others if you want to. 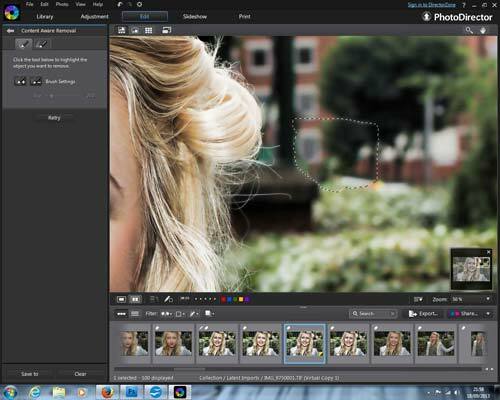 If you have the time and inclination, though, you can always sit and edit each picture manually as there's no batch process option. There's the option of adjusting regional areas such as red-eye, cropping or doing a bit of spot removal. On a more global scale (the entire photograph), you can change the white-balance temperature, contrast, saturation and clarity as well as adding a HDR effect or messing with the levels. The HDR effect isn't like a true HDR image, which is why they call it an effect. It's easy to think that the effect will replicate a HDR image precisely, but it can't generate detail in shadow areas that wasn't there in the first place. Likewise, it can't clip burn out when there was nothing there on the sensor for it to replace the burn out with.